Eugene, Oregon; a town known throughout the country to have some of the deepest roots in track and field history, enough to be called TrackTown USA. 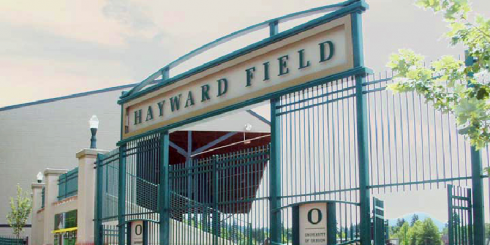 This title is in no small part thanks to historic Hayward Field that graces the campus of the University of Oregon. 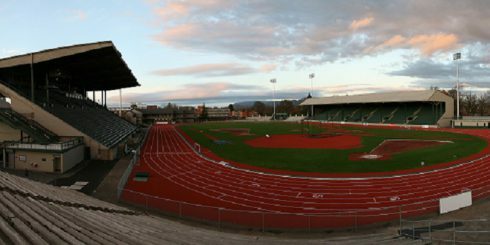 Hayward Field has been home to many important track meets where world records have been shattered, nail-biting races where athletes put everything on the line, and one of the greatest and most inspirational runners of all-time: Steve Prefontaine. Hayward is going to add another historic loop to its belt by being home to the first IAAF World Championship meet to ever be held on American soil. In terms of track and field the IAAF World Championship meet is the equivalent of hosting the Olympics, where the world’s bests gather to compete to win gold medals. But the problem is that Hayward is actually not very big. The stadium can only hold about 10,500 people, and in order to fully support all of the spectators from around the world, reconstruction of the stadium will be made to fit over 30,000. Renovation plans have led some in the track and field community to become upset. They claim that a site as historic as Hayward will have its integrity diminished because it will not remain the same as they experienced. People feel safe in a changeless environment, and the thought of any renovation to the historic site seems damnable, which is easy to understand. The renovations are not as terrible as they seem, however. While the picturesque grandstands that everyone imagines when they think of Hayward will be torn down, the historic smaller stands will remain untouched. So far the plan for the renovations will only change the grandstands by adding another story to them and extending them further to fully encompass the track. Also the throwing pits will be moved inside the stadium so the stands will be able to wrap around the track correctly. Part of the experience of competing at Hayward is being able to hear the crowd cheer along all parts of the track, not just at the finish line. Being able to fully wrap around the field and adding the throwing pits into the design will make the meets even more exciting than before. In my own opinion, I welcome the change. Ever since the Ducks’ football team took off, the whole TrackTown atmosphere has all but disappeared. The track team has taken multiple national championships recently on both the men’s and women’s sides. But does anyone really know about the accolades? You can walk into the Duck store on any given day during football season and you will see tons of clothes saying Rose Bowl champions or PAC-12 conference champions, making it entirely evident how well the football team has been doing. Track, however, needs more publicity in order to become more popular. Three former Ducks racing on their old home track. In fact, a true track and field purist would support the larger stadium. 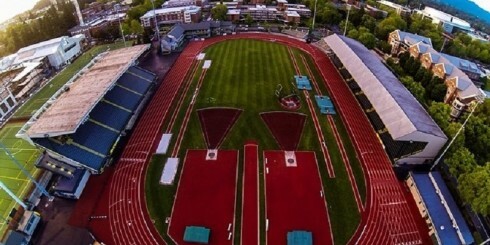 Bigger stadiums mean bigger meets, and what better way to bring more attention to the sport than having grand meets in our small town of Eugene? True fans of the sport would want it to get as much attention as possible, and putting Eugene on the world stage would be nothing short of a dream becoming a reality. 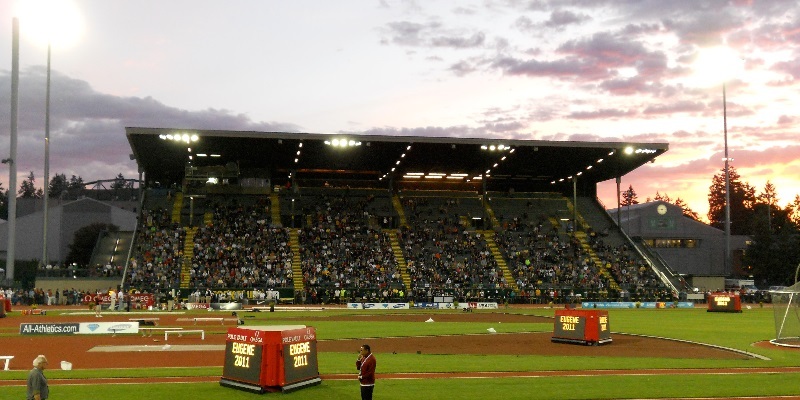 Yes, Eugene already holds some great meets, but to finally be able to hold a World Championship is incredible, and to prefer to keep the entire Hayward Stadium in its original state and give up on such a big opportunity for Eugene is nothing short of ridiculous. Let us try to take a look at how the renovations could be bad, so it does not seem like I am completely negating the other argument of why Hayward should keep its current charm: Hayward is a beautiful stadium, and most of its unmistakable atmosphere comes from its history and how it has retained its essence over the years. At critical angles, those old pictures you see of Hayward in black and white look the same as if you were to take one now. The feeling is a lot like that of going back home and seeing that everything is the same as when you left; it gives you a sense of warmth. People don’t want to go back home and find that their parents knocked down a wall of their old room to make more space for the kitchen. But sometimes change needs to happen. You have moved out of the house and that space of yours needs to be put to a new purpose. It is still your home, the original structure is intact, but a few things have changed. 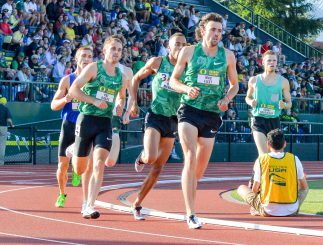 An opportunity for Eugene to host a World Championship is amazing, but to be the first ever on American soil is too good to pass up on no matter what the cost.